he Tudors tried to improve English mining techniques, partly by importing German expertise in the form of scientific treatises (such as that by Agricola) and German metallurgists to oversee mining projects. Thus, in the case of the Baffin mines, Jonas Schutz and Burchard Kranich played key roles. 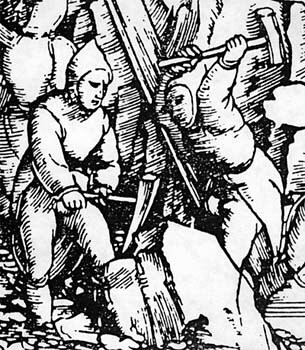 However, English miners of the sixteenth century were low on first-hand experience in mining hard rocks such as found in the Baffin Island region. Their experience was limited mostly to working shallow surface mines to extract soft rock such as limestone, shale, and slate, which could be broken with picks, sledgehammers, and chisels. Gunpowder was not used to break apart rock until the seventeenth century. Mining techniques likely to have been used in the Arctic include pick-and-hammer, plug-and-feather, and possibly fire-setting. The pick-and-hammer method required a single-tined pick, which has a head resembling a hammer at one end and a point at the other. This pick, used like a chisel, was held against the rock with one hand and struck into the rock with a hammer in the other hand. This technique would be used to crack the hardest veins. Under heavy use, the pick would stay sharp for about one hour, at which point it was either resharpened by a blacksmith or thrown away. There is evidence that this method was used on Kodlunarn Island. Narrow grooves can be seen in one wall of the "Ship's Trench". They are irregular marks formed by the pick being hammered into the rock. The plug-and-feather technique was employed to split rock with an obvious grain or fracture. Into an existing fracture or crevice - or one made using a pick - two iron plates (or "feathers") were inserted; an iron wedge was then driven between the plates. Placing several sets of feathers into the grain and hammering the wedges between them eventually forced the rock to break. Included in the inventory of mining tools taken to Meta Incognita are plates, wedges, chisels, and picks. This suggests that Frobisher's miners may have used the plug-and-feather method. Fire-setting involved heating a rock surface and then pouring cold water onto it so that it shattered. This method was commonly used on hard, brittle rocks such as those containing quartz. It would not have been very effective with the more flexible "black ore" which was taken from Meta Incognita. Frobisher's mines in the Baffin area were shallow surface trenches from which extremely hard rock was removed. Once the rock was broken from the surface, it was carried in baskets or pulled on sleds to small boats. The boats with their heavy loads then had to be rowed out to the ships. This was all tiring work. 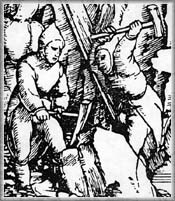 There were few labour-saving devices available to miners in the sixteenth century. 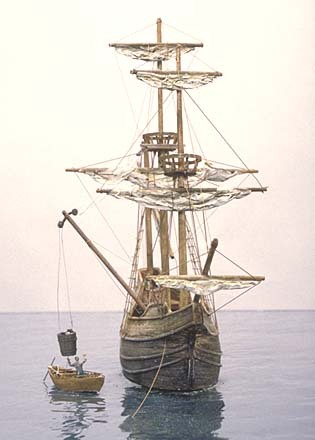 Beginning in the 1500s, sailors on ships used a jumper rig to lift and to weigh heavier objects. 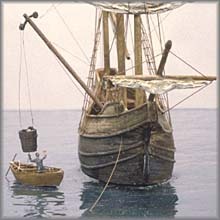 A jumper rig could lift a wicker basket filled with ore from the smaller boats to the ships. Nonetheless, mining and transporting was very hard work and the demanding schedule of the Arctic expeditions - the aim being to extract and load as much ore as possible before the short Arctic summer ended and the fleet had to return to England - resulted in many expedition members suffering hernias, back problems, sciatica, and limb fractures.